Showing 1 - 20 of 443 results. 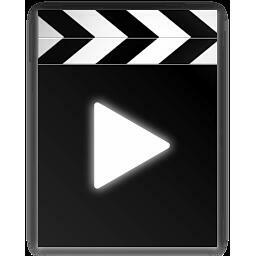 Video of Aaron Lewis's earthquake story, captured by the UC QuakeBox project. 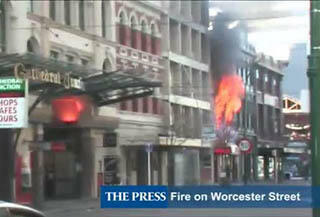 A video of a fire which broke out in the Pills for Thrills building on Worcester Street following the 4 September 2010 earthquake. The fire is thought to have been caused by a gas leak in the building. 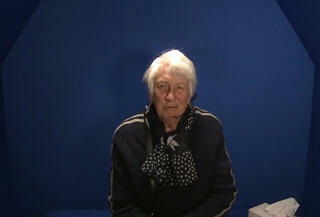 A video of an interview with Julia Holden about the ideas behind, and execution of, her 'its like now' exhibition. 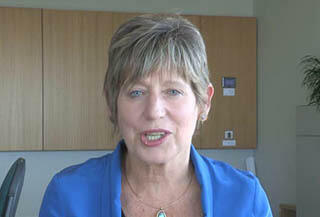 The video was created by Lizzy Guthrie. 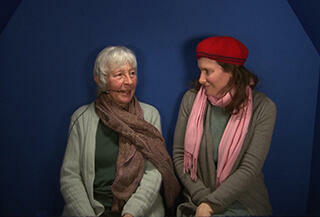 Video of Gwendolen (Wendy) Mary Smith's earthquake story, captured by the UC QuakeBox project. A City on the Move: Collaboration and Regeneration: "'Christchurch is now moving rapidly from the recovery phase into a regeneration stage with Central and Local Government working with the wider community, including the business community to ensure we get optimal outcomes for greater Christchurch' (CECC)." 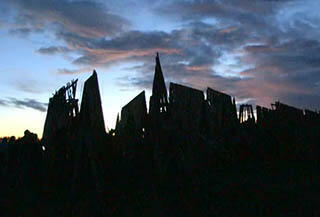 Looking Back: Remembering and Learning: "What are the milestones? What are the millstones? What have we learnt? What have we applied?" Looking Forward: Visioning and Building: "What do we aspire to? What are the roadblocks? What is the way forward?" 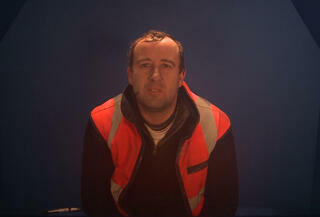 Video of Paddy's earthquake story, captured by the UC QuakeBox project. 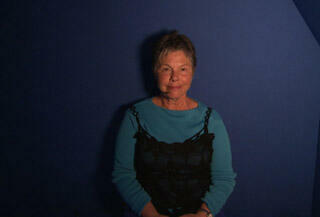 Video of Pam Vickers's earthquake story, captured by the UC QuakeBox project. 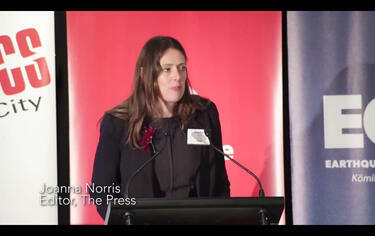 A video of an address by Joanna Norris, Editor of The Press, at the 2015 Seismics and the City forum. In this talk, Ms. Norris shares her take on the progress of the rebuild, positive signs of advancement and what's in the pipeline; and how the main obstacles can be resolved. A video of people protesting outside the Christchurch City Council offices on Worcester Street. 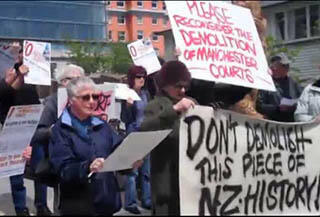 The are protesting the demolition of the Manchester Courts building. 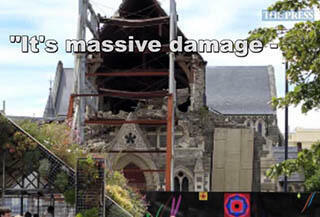 A video of quotes from members of the public about the Christchurch Cathedral. The quotes are superimposed over images of the public viewing the earthquake-damaged cathedral. 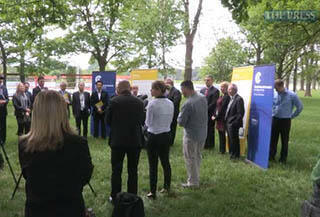 A video of a press conference with Earthquake Recovery Minister Gerry Brownlee and Mayor Lianne Dalziel. The conference was held to announce the implementation of the Accessible Transport Plan. Brownlee announces the introduction of a 30 km/h speed limit in the inner city zone, facilitating the use of bicycles and encouraging pedestrian movement within the centre city. Lianne also talks about how the plan allows for a clean, green, safe, and accessible city, reflecting the public's visions in the Share an Idea campaign. 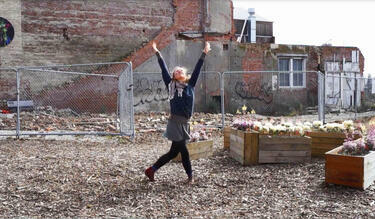 Video of Carolin Stechel's earthquake story,captured by the UC QuakeBox project. 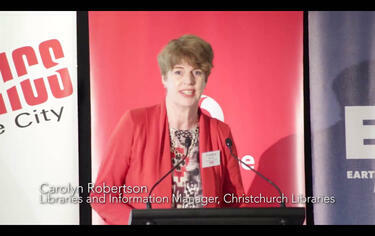 A video of an address by Carolyn Robertson, Libraries and Information Manager of Christchurch Libraries, at the 2015 Seismics and the City forum. The talk is about providing opportunities for input and feedback. Video of participant number NB770's earthquake story, captured by the UC QuakeBox project. 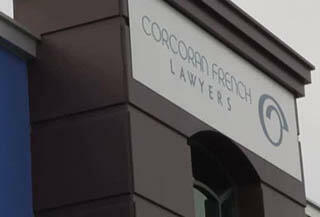 A video of an interview with Martin Bell, Managing Partner at Corcoran French, about the company's experiences after the 2010 and 2011 Canterbury earthquakes. 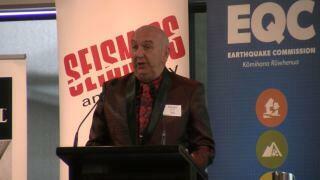 This video is part of The Press's 'Up and Running' series which showcases businesses which stayed up and running despite the challenges posed by the 2010 and 2011 Canterbury earthquakes. A video of an interview with students from Shirley Boys' High School about the plans to merge their school with Christchurch Boys' High School.